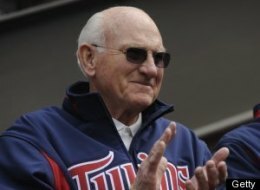 Sad news that the great Harmon Clayton Killebrew passed away on Tuesday. 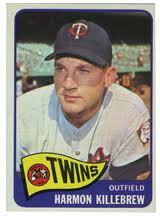 A true star of baseball, Killebrew had some great stats including being #4 on the all-time home run list. He has since been passed by Bonds (juicer), Sosa (juicer), McGwire (juicer), Rodriguez (juicer), Thome and Griffey, Jr. He lost his battle with cancer after announcing on Monday he was entering a hospice for his final days. I used to commute by train every day. 90 minutes each way from my home to New York City. Usually on NJ Transit, but I also got to ride the Amtrak train that connects Washington and New York, as Amtrak and NJT had a working agreement. On the Amtrak train there was always one, if not two cars designated non-cell phone cars. The rules were simple...no cell phones. OK, if yours rang, you could say "call you back" and wait until the train arrived, or change cars. Well, I found this story both funny and sad...Lakeysha Beard boarded the Coast Starlight, which runs between Los Angeles and Seattle in Oakland on Saturday evening at 10:00pm. After SIXTEEN - you heard me correct SIXTEEN - hours of non-stop talking on her cellphone, while sitting in one of the no cellphone cars, Beard was confronted by a passenger and got belligerent. Yup...SHE got belligerent...typical of someone who cares little for their fellow human beings. The Amtrak personnel stopped the train and had the police remove her just outside Salem, Oregon. First off, the cars have signs like every five feet saying NO CELL PHONES, so unless Ms. Beard can not read the language, she knew she was breaking the rule and disturbing her fellow passengers. 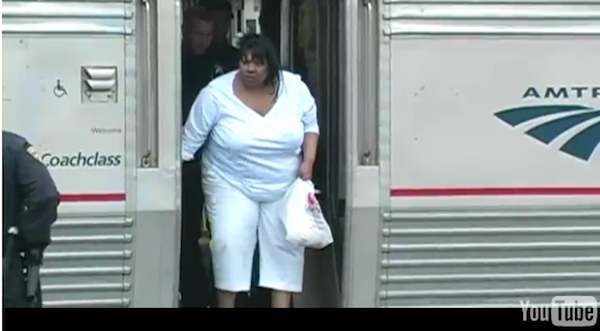 The train crew made repeated announcements that Ms. Beard ignored. Finally, who in the bright blue world talks on a cell phone for 16 hours???? Anderson Cooper blasted the woman on his "ridiculist" last night, asking "What could someone possibly talk about for 16 hours?" He even compared being stuck on the train with a person who would do such a thing to the "fifth circle of hell." Ms. Beard, do everyone a favor and get a life and put down the dang phone! 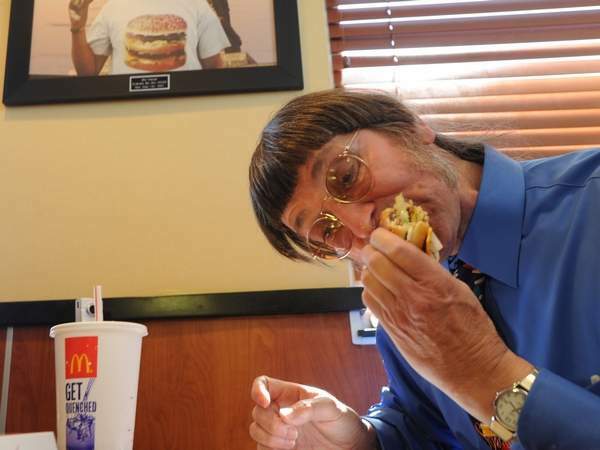 57-year-old Don Gorske has special plans for Tuesday, May 17: He's going to be eating his 25,000th Big Mac at McDonald's! 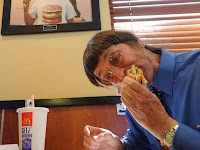 The Fond Du Lac, Wisconsin resident usually eats two a day and had his first Big Mac on -- wait for it -- May 17, 1972. 39 years later, he's on his 25,000th. Gorske says his 25,000th is a milestone because people believed he wouldn't live this long. Hmmmm...maybe I should have kept track of how many boxes of Kraft Mac & Cheese I've eaten in my career. Advice to cell phone person...get an unlimited text plan. Woman on phone should have been dragged behind the train the rest of the way to Seattle...thumpthumpthumpthumpthump..
16 straight hour of talking? Well, I guess we've found Jerry Lewis' replacement! I grew up with Don Gorski, that's right, he changed the i to an e, and he's still just as ugly as he was when I knew him on Hurd St. in Lynn, Mass. I saw him on TV last night and just about sh*t.
TRAVIS: What would your guess be? PHFRANKIE: If I had to is the key to that statement..and wouldn't you rather have a hot dog? Well, there were times in my life when mac & cheese, cans of Spaghettio's, and peanut butter were about all I could afford. So I would say it breaks down on average to about a box/week every week since I was about 5. Call it just short of 2200 boxes. Kinda serious yes, I think it's him. The right age, same as me. FYI, Harmon Killibrew's funeral was held at a megachurch a mile north of my house.